How’d you do? How about these? 15 Spanish words. I’m guessing you got a 100% on this quiz. 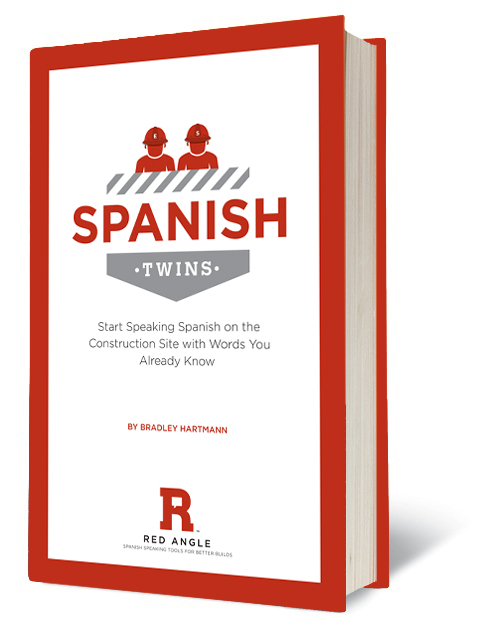 I’m excited to announce the official release of the Red Angle’s first book – Spanish Twins: Start Speaking Spanish on the Construction Site with Words You Already Know. If you’ve been following along to these posts for any amount of time, you’ve surely seen a reference (or dos, or tres, or más….) to Spanish Twins – words or phrases that are identical or nearly the same in both languages. I believe most people would like to know another language. They may not be interested in investing the time to learn it, but they like the idea of acquiring another language. Rosetta Stone® claims that 20% of Americans list “not learning a language” as one of their life’s biggest regrets. All other things being equal, knowing two languages is better than one, even if you are not completely fluent. As individuals and companies are looking for an edge, language has the potential to become a competitive advantage. Whether it’s the job market or firms looking for new customers, conversing in a 2nd language helps you stand out. Making a foreign language easy and fun to learn is hard. That’s why it’s rarely done. Whether you are staring at a computer loaded with Rosetta Stone® for 150+ hours or you’re listening to your Sophomore year Spanish teacher drone on about the Subjunctive…. It’s easy to make Spanish hard to learn. By studying up on words you already know (base, cable, control, material, plan: Identical Spanish Twins…) because you are fluent in English – your vocabulary in Spanish can grow by leaps and bounds. If the goal is to limit the number of individuals speaking Spanish, then this is the best kept secret… until now. Spanish Twins has over 1000 words or phrases – specific to construction – that you’ll be able to pick up quickly and use on the jobsite immediately. The book is broken down into easily identifiable sections (Nouns, Verbs, Adjectives) so you can flip through the book easily and start assembling phrases to help you manage a safer, more productive jobsite. If this learning-construction-Spanish thing sounds interesting and you know individuals working in construction, please forward this post to them and help spread the word. Happy reading! Available digitally for Kindle and iPad also.